I just love this project. The farm belongs to friends of ours and we stayed in the new building for the first time over the 2012 Christmas break. I woke up with the birds and, trust me, watching dawn slide over the paddocks from a warm bed in a tin shed is truly magical. The best part is you don’t have to sacrifice comfort for the experience. This is what the old shed looked like. A disused, falling-down heap a few hundred meters from the main farm homestead. Many people would have bulldozed the building but Philip Barrett-Lennard, a 6th-generation farmer and agricultural consultant, always had a fondness for the place and considered moving his home-office there. His daydreams of installing a glass box inside were a tad impractical, so the idea expanded to include accommodation for visitors and finally became a B&B-style renovation with room for an office. 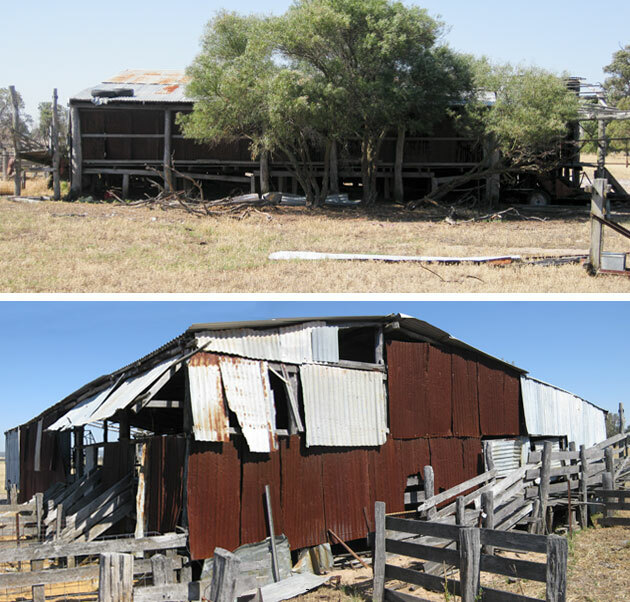 Structurally the c. 1940s shearing shed was still strong. 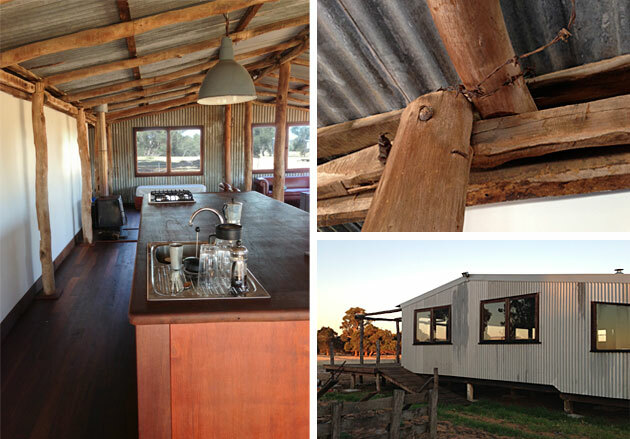 The hand-cut beams and old tin roof were features Philip and Sally were keen to retain, so the family set to work removing rubbish, sorting reusable materials and paring the building down to the bare frame. Then they carefully rebuilt a stylish 2 bedroom, self-contained bungalow. – Old metal wool presses as garden decoration. To me, this is a successful junk-style project. Philip and Sally retained the pioneering heart of a historical building; mixed old and new materials with care; and upcycled an outdated resource into a valuable asset. 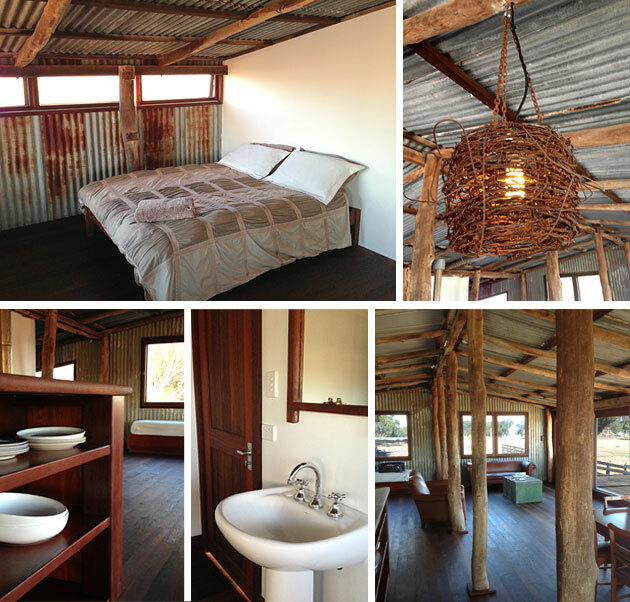 AND… it’s a fun, peaceful place to stay with a rustic ambience that charms your socks off! By Lara Bartlam, January 2013, www.thejunkmap.com.au. Please head to our accommodation page for more details. Beermullah is a working cattle farm about 100km north of Perth in Western Australia. We choose sustainable farming practices wherever possible and are proud to be part of the national Grain & Graze programme trialling new methods of conservation and biodiversity; and the Healthy Wetlands Habitats Programme revegetating Beermullah Lake. 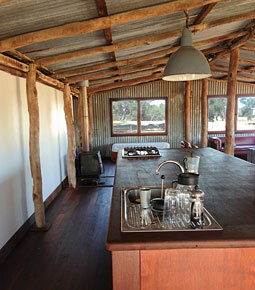 We also offer weekend farm stays in our stylishly renovated shearing shed. A perfect spot for country relaxation or birdwatching. Click here for more information.